For the football trophy, see Golden Hat Trophy. The hats are associated with the Proto-Celtic Bronze Age Urnfield culture. Their close similarities in symbolism and techniques of manufacture are testimony to a coherent Bronze Age culture over a wide-ranging territory in eastern France and western and southwestern Germany. A comparable golden pectoral was found at Mold, Flintshire, in northern Wales, but this appears to be of somewhat earlier date. The cone-shaped Golden Hats of Schifferstadt type are assumed to be connected with a number of comparable cap or crown-shaped gold leaf objects from Ireland (Comerford Crown, discovered in 1692) and the Atlantic coast of Spain (gold leaf crowns of Axtroki and Rianxo). Only the Spanish specimens survive. The archaeological contexts of the cones are not very clear (for the Berlin specimen, it is entirely unknown). At least two of the known examples (Berlin and Schifferstadt) appear to have been deliberately and carefully buried in antiquity. Although none can be dated precisely, their technology suggests that they were probably made between 1200 and 800 BC. It is assumed[by whom?] that the Golden Hats served as religious insignia for the deities or priests of a sun cult then widespread in Central Europe. Their use as head-gear is strongly supported by the fact that the three of four examples have a cap-like widening at the bottom of the cone, and that their openings are oval (not round), with diameters and shapes roughly equivalent to those of a human skull. The figural depiction of an object resembling a conical hat on a stone slab of the King's Grave at Kivik, Southern Sweden, strongly supports their association with religion and cult, as does the fact that the known examples appear to have been deposited (buried) carefully. Attempts to decipher the Golden Hats' ornamentation suggest that their cultic role is accompanied or complemented by their use as complex calendrical devices. Whether they were really used for such purposes, or simply presented the underlying astronomical knowledge, remains unknown. The gold cones are covered in bands of ornaments along their whole length and extent. The ornaments - mostly disks and concentric circles, sometimes wheels - were punched using stamps, rolls or combs. The older examples (Avanton, Schifferstadt) show a more restricted range of ornaments than the later ones. It appears to be the case that the ornaments on all known Golden Hats represent systematic sequences in terms of number and types of ornaments per band. A detailed study of the Berlin example, which is fully preserved, claimed that the symbols possibly represent a lunisolar calendar. The object may have permitted the determination of dates or periods in both lunar and solar calendars. Since an exact knowledge of the solar year was of special interest for the determination of religiously important events such as the summer and winter solstices, if astronomical knowledge was depicted on the Golden Hats it would have been of high value to Bronze Age society. Whether the hats themselves were indeed used for determining such dates, or whether they even represented such knowledge, remains unknown. The functions hypothesized so far would permit the counting of temporal units of up to 57 months. A simple multiplication of such values could also permit the calculation of longer periods, e.g. metonic cycles. Each symbol, or each ring of a symbol, may represent a single day. Apart from ornament bands incorporating differing numbers of rings there are seemingly special symbols and zones in intercalary areas, which may have had to be added to or subtracted from the periods in question. The system of this mathematical function incorporated into the artistic ornamentation has not been fully deciphered so far, but a schematic study of the Berlin Golden Hat and the periods it may delimit has been attempted. In principle, according to this theory, starting with zone Zi, a sum is achieved by adding a relevant contiguous number of neighbouring sections: Zi .. Zi+n. To reach the equivalent lunar or solar value, from this initial sum must be subtracted the sum of symbols from the intercalary zone(s) within the area counted. The illustration depicts the solar representation on the left and the lunar one on the right. The red or blue fields in zones 5, 7, 16 and 17 are intercalary zones. The values in the individual fields are reached by multiplying the number of symbols per zone with the number of rings or circles incorporated in each predominant symbol. The special symbols in zone 5 are assigned the value of "38", as indicated by their number. Zone 12 is dominated by 20 repetitions of punched symbol No. 14, a circular disc symbol surrounded by 5 concentric circles. Thus, the symbol has the value of 20 x 5 = 100. The smaller ring symbols placed between the larger repetitions of No. 14 are considered as mere ornaments and thus not counted. Through this system, the Hats could be used to calculate a lunisolar calendrical system, i.e. a direct reading in either lunar or solar dates, as well as the conversion between them. The table can be used in the same way as the original Golden Hats may have been. To determine the number of days in a specific time period (yellow fields), the values of the coloured fields above are added, reaching an intermediate sum. If any of the red intercalary zones are included, their sum has to be subtracted. This allows the calculation of 12, 24, 36, 48, 54 and 57 synodic months in the lunar system and of 12, 18, 24, 36, 48, 54 and 57 sun months (i.e. twelfths of a tropical year). To determine a 54 month cycle in the lunar system, the numerical values of the green or blue zones 3 to 21 are added, reaching a sum of 1,739 days. From this, the values of the red intercalary fields 5, 16 and 17 are subtracted, The result is 1739-142=1597 days, or 54 synodic months of 29.5305 days each. The overall discrepancy of 2 days to the astronomically accurate value is probably the result of a slight imprecision in the Bronze Age observation of synodic and solar month. The Golden hats known so far are made from a gold alloy containing 85-90% Au, about 10% Ag and traces of Cu and Sn (< 1% each). They are made of seamless single pieces of gold sheet, hammered to a thinness between 0.25 millimetres (0.0098 in) (Schifferstadt) and 0.6 millimetres (0.024 in) (Berlin). Thus, the cones are surprisingly light considering their size. The Ezelsdorf example, measuring 89 centimetres (35 in) in height, weighs only 280 grams (9.9 oz). Because of the tribological characteristics of the material, it tends to harden with increasing deformation (see ductility), increasing its potential to crack. To avoid cracking, an extremely even deformation was necessary. Additionally, the material had to be softened by repeatedly heating it to a temperature of at least 750 °C (1,380 °F). Since gold alloy has a relatively low melting point of about 960 °C (1,760 °F), a very careful temperature control and an isothermal heating process were required, so as to avoid melting any of the surface. For this, the Bronze Age artisans used a charcoal fire or oven similar to those used for pottery. The temperature could only be controlled through the addition of oxygen, using a bellows. Considering the tribologic conditions and the technical means available at the time, the production even of an undecorated Golden hat would represent an immense technical achievement. In the course of their further manufacture, the Golden hats were embellished with rows of radial ornamental bands, chased into the metal. To make this possible, they were probably filled with a putty or pitch based on tree resin and wax - in the Schifferstadt specimen, traces of this have survived. The thin gold leaf was structured by chasing: stamp-like tools or moulds depicting the individual symbols were repeatedly pressed into (or rolled along) the exterior of the gold. Combs were also used. The gold hats were first brought together for comparison and set in the broader context of the culture of Bronze Age Europe in a 1999 exhibition in Bonn, Gods and heroes of the Bronze Age: Europe in the time of Odysseus. Normally they reside in separate museums, at Berlin (Museum für Vor- und Frühgeschichte), Speyer (Historisches Museum der Pfalz, the Schifferstadt specimen), Nuremberg (Germanisches Nationalmuseum, the Ezelsdorf one), and Saint-Germain-en-Laye (Musée d'Archéologie Nationale). Nebra sky disk, another Central European metal object from the Bronze Age expressing advanced knowledge of astronomy, between 1700 and 2100 BC. ^ Chadwick, Nora; Corcoran, J. X. W. P. (1970). The Celts. Penguin Books. pp. 28–33. ISBN 0140212116. OCLC 631775651. ^ Source: Menghin, op. cit. 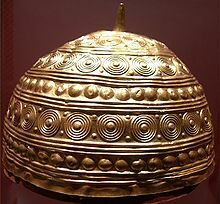 Wikimedia Commons has media related to Bronze Age golden hats. Mysterious gold cones 'hats of ancient wizards' , Daily Telegraph, 17 March 2002. Retrieved 27 January 2016.